Resurrection! It's been a long time since my last post. Might have been the longest in between posts ever. Hopefully I will be able to post more regularly now. During the last 2-3 months writing my thesis occupied most of my time (just graduated this Friday), but nevertheless I was still able to sneak in a few minutes of music every day. No shower without loud music blasting out of my speakers. So there is still quite a bit of music I wanna share with you all. 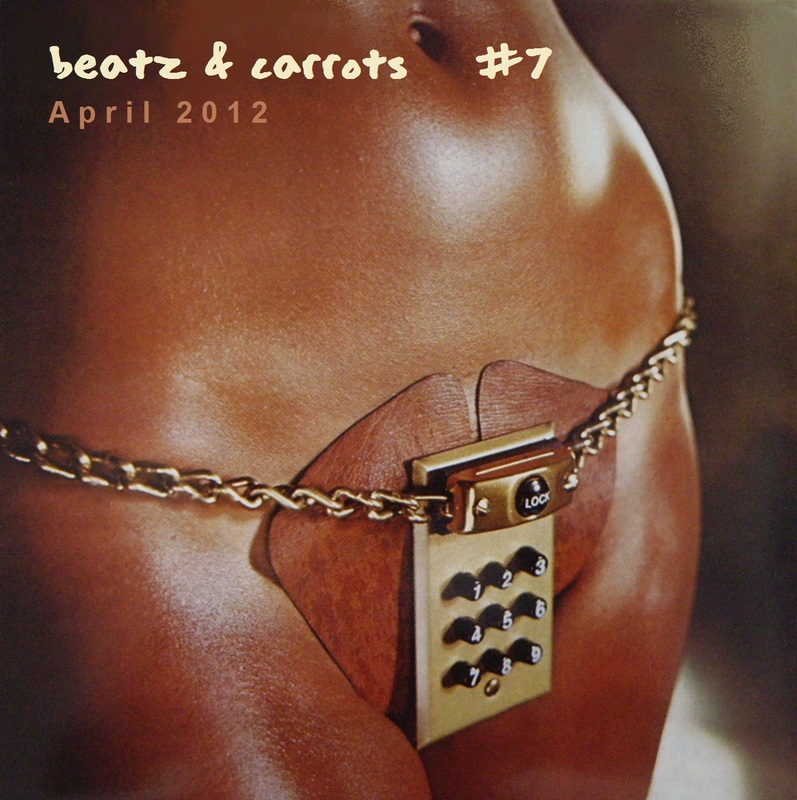 Let's start with the April Beatz & Carrots selection which I was finally able to compile! Song #1 is „Angola“ by the Combo De La Musica. Baaam! That song hit me straight since I first heard it in a mix somewhere. Beautiful song. Don't know how to describe it – but it has all the right ingredients: Jazz, Afro-Latin sounds via Sweden, real instruments (and a lot of them! ), a powerful singer, a bit of a Quantic feeling - AND - the music is energetic, it’s funky, it makes you want to sing and dance. They just released a 7inch on Traveller Records and you can listen to it here. Song #2 is El Yaibi by Musi Kal, a sweet little bouncing tune that uses Quantic's great „Mas Pan“ sample as an intro - and from there it goes Cumbiaaa!!! Makes the summer sun shine even nicer! Track #4 - has Dam Funk giving us a little remix treatment of Ariel Pink's „Fright Night (Nevermore)“ - adding more funk and bounce to this ghostly tune. I like the feeling of the song: surreal lo-fi, leftfield, pop, punk, electronic, fast, slow aesthetics. Track # 5, Testpattern's „Techno Age“ from the album Après-Midi (1982) continues with similar aesthetics: „Gorgeous technopop from Japan… half video game soundtrack, half zen meditation“, using a sample from an 80ies Hongkong Kung-Fu movie. Thanks to yerdarlingdaily for sharing this one. „Pino Daniele - Yes I Know My Way (Special 12inch Version)“ - track #6, is another recent favorite of mine. Not much info available on this soulful & funky boogie disco song from Italy. Apparently from 1985. Thanks to DJ Prime for introducing me to this one. Looking forward to his edit as well - give it a listen here. Track #8 gives us a killer edit of Barbara Lynn's classic „I'm A Good Woman“ by Maxey & Fred Spider. Next to the original - this is probably my favorite version of „I'm a good Woman“! More groove, more funk, more boom! Play it out loud! Maxey & Fred Spider are part of Los Chicos Altos, who have released some brilliant electronic World Music on UrbanWorld Records and Spring Strut Records. Track # 9 gives us some uptempo Cumbiaaa! madness. DJ Still Life's edit of „Los Graduados - Ese Muerto No Lo Cargo Yo“. This is what DJ Still Life says about the song on his soundcloud page: „Heavy dancefloor business from Colombia's Los Graduados, w/ lyrics about being wrongly fingered for a murder. I added some extra percussion, beefed up the low-end, and extended the intro and outro for easier addition to DJ sets. You can check out the original (and super silly video) here.“ Crazy crazy fast crazy uptempo cumbia tune. I love it! Check out more great music and freebies on his soundcloud page. Track #10 is Solo Moderna's balkumbia remix of Dance Cleopatra. Originally a Ska song (and what a Ska song!!!) by Prince Buster, Sono Moderna created something totally new and beautiful out of it. Well - anything with Solo Moderna, Balkumbia and Dance Cleopatra in it is a not to be missed winning-combination! This track gets better with every time I listen to it. Hugely addictive. And the Sister Nancy sample really kills it! So good! Definitely a song that is going to be shaking up the dancefloors this summer. Track #11 - Mambo Grodo is one of those simple feel-good-songs. Monetrik giving Xavier Cugat's Mambo classic some good greek loving! Beautiful! Track #12 - Griz's You Got To Change is another winner! A deep burning version of Willie Bobo's Evil Ways. Track #13: „Pastor T.L. Barrett and the Youth For Christ Choir - Like A Ship... (Without A Sail)“ - You may or May not be into it. But it’s been killing me the last couple weeks. What a song! What music! Living in China in 2012 - where perfect materialism covered up with fake Chinese communist attributes (sing me the song of „The Emperor's New Clothes“) is sucking out the last bit of soul and spirituality that Mao left after his mad reign - a bit of spirituality and soul is much needed. And if it is only a strong message shared in a little Gospel song! Beautiful & Uplifting! Track #14 has been a song and album on my want- and wish list for quite some time: Jungle By Night's Ethiopino. Listen to the first 10 seconds - and you know this song is good. 2012 - Afro-Beat, Afro-Funk, Jazz never sounded more fresh, raw & real. Check this review on my ever-favourite parisdjs.com or check out their website for more. Track #15: "Ras Michael & The Suns Of Negus - Wicked Men". Rasta got the message. Reggae got the message. "With a bif baf bif bif boof - people shall unite..." If you listen carefully to a lot of Reggae songs, old and new - so many of them share a message which is now more true than ever. And more needed than ever! Play it loud and spread the message! (I am currently working on a compilation of songs - with powerful music and even stronger lyrics: Sharon Jones - What If We All Stopped Paying Taxes, Yami Bolo - Babylon Is Out A Control, Tom Fire - Brainwash, Charles Bradley - The World (Is Going Up In Flames), Manu Chao - Politik Kills. If you know any similar songs I should know and put on that compilation - please post them in the comments! Thanks!!!). Track #16 is Thomas Mapfumo's "Hokoyo" which means "Watch Out!" in Shona, and Mapfumo was eventually arrested and jailed for the overtly political lyrics of the song, which were a warning to the white government of Rhodesia, today known as Zimbabwe. Musically the song is a straight and upbeat R&B shuffle, the only tip-off to its non-American nature coming from the lanky Shona vocals tossed back and forth between Mapfumo and the members of his Band. Track #18 goes out straight to my friend and fellow blogger Duendiness: Ernest Ranglin - In The Rain. I know he will like it ;-) A deep Reggae cover of The Dramatics In The Rain from 1971 with some far-away vocals and Ernest Ranglin on guitar. Chill deluxe! Taken from Ernest Ranglin - From Kingston JA to Miami USA (1983). welcome back! and congrats for your graduation! Dubme more more... BIG UP! impeccable selection once again, truly inspiring and warmly commented, thank you dubme :) Pastor T.L. Barrett and the Youth For Christ Choir touched me deeply.